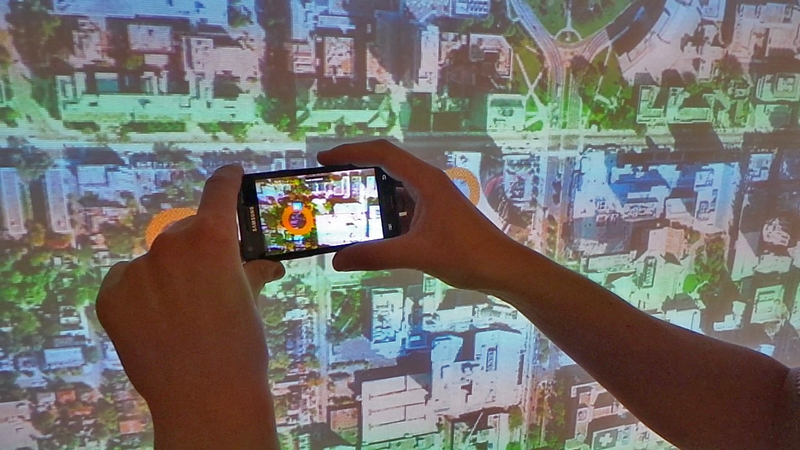 Information browsing at printed maps is a popular application area for handheld AR which was envisioned by researchers since more than 10 years and recently becomes also available in consumer contexts (e.g., via www.tunnelvisionapp.com). Early research investigated the applicability of AR for important information browsing problems such as locator tasks (i.e. finding a target object with desired attributes among distractor objects) . However, the employed tracking technology in previous studies suffered from severe limitations such as a small operational range between handheld device and map (6-21cm) and a low update rate of the tracker of only 10Hz. We found that users adopt their behavior to the capabilities of the available tracking technologies for AR interaction. Due to recent advances in computer-vision based tracking (30 Hz update rate, large operational range of up to 200cm in our studies) it is advisable to re-investigate the potentials of AR for information browsing at public maps. To this end we investigated both performance and user experience aspects for AR browsing at printed maps. 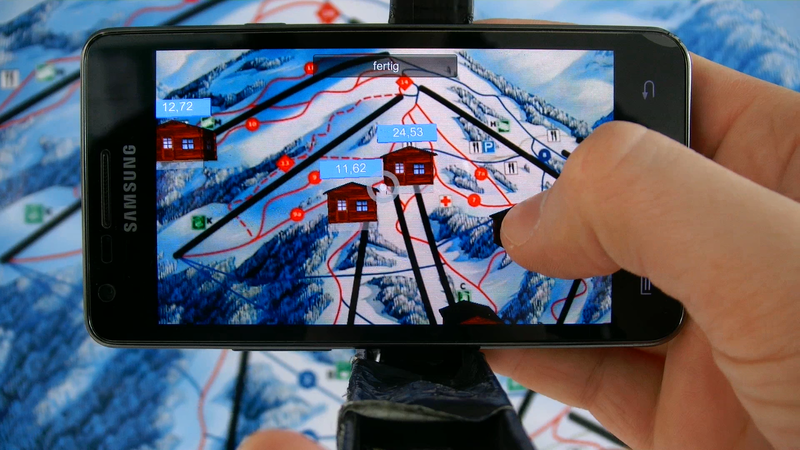 In contrast to previous studies a semi-controlled field experiment in a ski resort indicated significant longer task completion times for an AR interface compared to a static peephole interface. A follow-up controlled laboratory study investigated the impact of workspace size on the performance and usability of both interfaces. We showed that for small workspaces static peephole outperforms AR, confirming indications of previous studies. As workspace size increases performance gets equivalent and subjective measurements indicate less demand and better usability for AR. Our results indicate that AR can be beneficial for interaction with public posters going beyond hedonic user experience aspects, which are oftenaddressed in advertising gaming apps, adding utilitarian value to mobile interactive AR experiences. 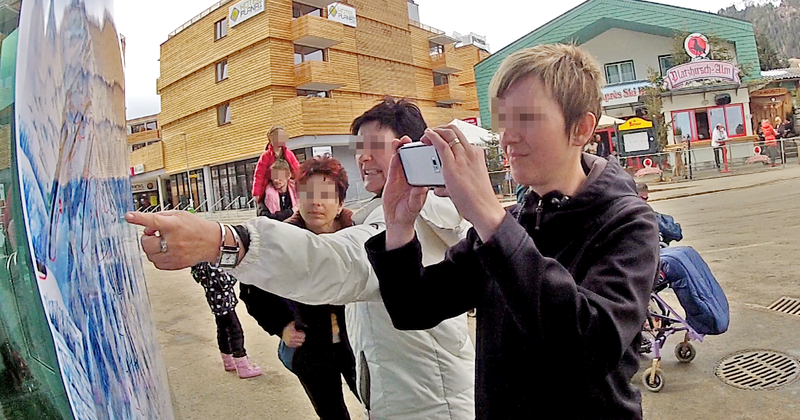 Participant interacting with the Magic Lens interface in the field study in Schladming while two passers-by use the map for navigation purposes. The Magic Lens interface used in the semi-controlled field study. The Magic Lens interface used in the laboratory study. Alessandro Mulloni, Jens Grubert, Hartmut Seichter, Tobias Langlotz, Raphael Grasset, Gerhard Reitmayr and Dieter Schmalstieg. 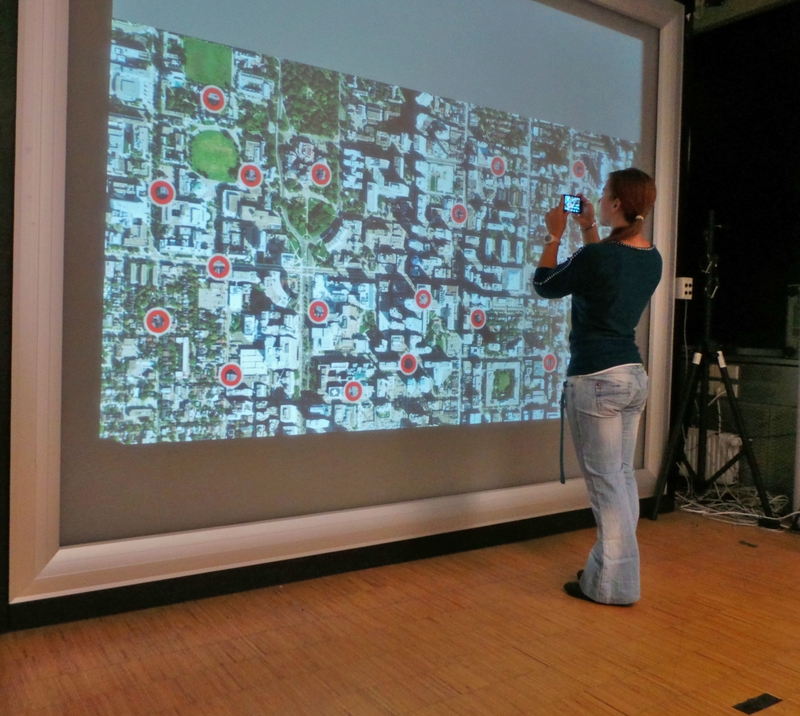 Experiences with the Impact of Tracking Technology in Mobile Augmented Reality Evaluations. In Mobile Vision and HCI (MOBIVIS) workshop at ACM SIGCHI’s International Conference on Human-Computer Interaction with Mobile Devices and Services 2012 (MobileHCI’12,) September 21-24, 2012, San Francisco, CA, USA.